Jiangxi (Chinese: 江西; pinyin: Jiāngxī; Wade-Giles: Chiang-hsi; Postal map spelling: Kiangsi) is a southern province of the People's Republic of China, spanning from the banks of the Yangtze River in the north to the hillier areas of the south. The province borders Anhui to the north, Zhejiang to the northeast, Fujian to the east, Guangdong to the south, Hunan to the west, and Hubei to the northwest. The name of the province does not mean "west of the Yangtze" as a literal reading would imply, but instead originated as a contraction of "Jiangnan Xi" (江南西; "West Jiangnan," or more literally "the west of the south of the Yangtze." The name was coined when Jiangnan ("south of the Yangtze") Circuit was split into western and eastern halves during the Tang Dynasty. Jiangxi had served as a main trade route in ancient and Medieval China, drawing wealth and power to the region. Sitting one province removed from the China Gold Coast, the province lost its economic preeminence and power during the twentieth and twenty-first centuries. The province has natural strengthens that bode well for its growth in the twenty-first century. Blessed with an abundance of water, Jiangxi is the rice producing leader of China, and enjoys approximately 25 percent of the fresh water fish in its lakes, rivers, and streams. The provinces greatest resources may be its natural beauty and ecology, as well as spiritual heritage in Daoism, Buddhism, and Confucianism. Jiangxi is centered on the Gan River valley, which historically provided the main north to south transport route of southern China. The corridor along the Gan River is one of the few easily accessible routes for travelers through the otherwise mountainous and rugged terrain of the south-eastern mountains. This open corridor was the primary route for trade and communication between the North China Plain and the Yangtze River valley in the north and the territory of modern Guangdong province in the south. As a result of this commercial activity, Jiangxi has been strategically important throughout much of China's history. Jiangxi was outside the sphere of influence of early Chinese civilization during the Shang Dynasty (sixteenth to eleventh centuries B.C.E.). Information about this era is scarce, but it is likely that peoples collectively known as the Yue inhabited the region. During the Spring and Autumn Period, the northern part of modern Jiangxi formed the western frontier of the state of Wu. Two settlements are known of at this time: Ai (艾), and Po (番, later 潘). After Wu was conquered by the state of Yue (a power based in modern northern Zhejiang) in 473 B.C.E., the state of Chu (based in modern Hubei) took over northern Jiangxi with some residual Yue influence prevalent in the south. Chu crushed this remaining Yue presence in 333 B.C.E., and was later conquered by the state of Qin in 221 B.C.E. Qin established the Qin Dynasty in that same year, which became the first unified Chinese state. The unification of China by the Qin Dynasty saw the incorporation of Jiangxi into the Qin empire. The Qin Dynasty established a two-tier administration system in China, with commanderies on top and counties below. Seven counties were established in what is now Jiangxi, all of them administered from Jiujiang commandery, located north of the Yangtze in modern Anhui, not the modern city of Jiujiang in Jiangxi. All of the county seats were located along the Gan River system, and most of them were no more than a day or two separated from the Qin routes to the newly incorporated territories further south in Nanhai commandery (modern Guangdong). Military settlements were known to have existed in at least two of the counties. Qin colonization formed the earliest settlement structure in Jiangxi and for the most part, the territorial borders established by the Qin have survived to the present day. Yuzhang commandery (豫章) was established in northern Jiangxi at the beginning of the Han Dynasty. It was named after the Yuzhang River (豫章江), the original name of Gan River (贛江). "Gan" has since become the abbreviation of the province as a whole. In 201, eight counties were added to the original seven of Qin, and three more were established in later years. Throughout most of the Han Dynasty, the commandery's 18 counties covered most of the modern province of Jiangxi. The county seats of Nanchang, Gan, Yudu, Luling, and others were located at the sites of modern major cities. Other counties, however, were moved or abolished in later centuries. Under the reign of Emperor Wu of the Han Dynasty, Yuzhang Commandery was assigned to Yangzhou Province, as part of a trend to establish provinces (zhou) all across China. In 291, during the Western Jin Dynasty, Jiangxi became its own zhou called Jiangzhou (江州). During the Northern and Southern Dynasties, Jiangxi was under the control of the southern dynasties, and the number of zhou slowly increased. During the Sui Dynasty, there were seven commanderies and 24 counties in Jiangxi. During the Tang Dynasty, another commandery and 14 counties were added. Commanderies were then abolished, becoming zhou (henceforth translated as "prefectures" rather than "provinces"). Circuits were established during the Tang Dynasty as a new top-level administrative division. At first Jiangxi was part of the Jiangnan Circuit (lit. "Circuit south of the Yangtze"). In 733, this circuit was divided into western and eastern halves. Jiangxi was founded in the western half, which was called Jiangnanxi Circuit. The literal translation of this was "Western circuits south of the Yangtze," which is the source of the modern name "Jiangxi." The Tang Dynasty collapsed in 907, heralding the division of the Five Dynasties and Ten Kingdoms period. Jiangxi first belonged to the kingdom of Wu (吳), then to the Southern Tang (南唐). Both states were based in modern-day Nanjing, further down the Yangtze River. During the Yuan Dynasty, the circuit was divided into thirteen different circuits, and Jiangxi Province was officially established for the first time. This province also included the majority of modern Guangdong. Jiangxi acquired (more or less) its modern borders during the Ming Dynasty after Guangdong was separated out. There has been little change to the borders of Jiangxi since. After the fall of the Qing Dynasty, Jiangxi became one of the earliest bases for the Chinese communists, and many peasants were recruited to join the growing people's revolution. The Nanchang Uprising took place in Jiangxi on August 1, 1927, during the Chinese Civil War. Later on, the Communist leadership hid in the mountains of southern and western Jiangxi, in order to avoid the Kuomintang's attempts to eradicate them. In 1931, the Chinese Soviet Republic's government was established in Ruijin (瑞金), which is sometimes called the "Former Red Capital" (红色故都), or just the "Red Capital." In 1935, after complete encirclement by the Nationalist forces, the Communists broke through and began the Long March to Yan'an in modern day Shaanxi province. After that, the tide of the war shifted, and the CCP eventually forced the KMT out of mainland China to Taiwan, allowing them to establish the People's Republic of China in 1949. Mountains surround Jiangxi on three sides, with the Mufu Mountains, Jiuling Mountains, and Luoxiao Mountains lying to the west, the Huaiyu Mountains and Wuyi Mountains to the east, and the Jiulian Mountains and Dayu Mountains in the south. The southern half of the province is hilly with ranges and valleys interspersed throughout its territory, while the northern half is flatter and lower in altitude. The highest point in Jiangxi is Mount Huanggang in the Wuyi Mountains on the border with Fujian. It has an altitude of 2157 m.
The Gan River dominates the province, flowing through its entire length from south to north. It enters Lake Poyang in the north, which is the largest freshwater lake in all of China. That lake in turn empties into the Yangtze River, which forms part of the northern border of Jiangxi. Important reservoirs include the Xiushui Tuolin Reservoir in the northwest of the province on the Xiushui River, and the Wan'an Reservoir in the upper section of the Gan River. Jiangxi's climate is subtropical and characterized by its warmth and humidity. Average temperatures are about 3 to 9°C in January and 27 to 31°C in July, but the provincial capital city of Nanchang is well known as one of the hottest cities in all of China. Annual precipitation in the province as a whole is 1,200 to 1,900 mm. 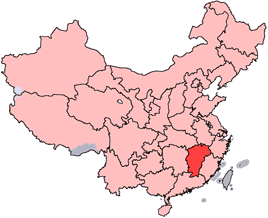 The eleven prefecture-level divisions of Jiangxi are subdivided into 99 county-level divisions (nineteen districts, ten county-level cities, and 70 counties). Those in turn are divided into 1,548 township-level divisions (770 towns, 651 townships, seven ethnic townships, and 120 subdistricts). Jiangxi is one of China's largest grain producers, with a well developed farming industry. Rice is the dominant crop, accounting for almost 80 percent of the total land dedicated to grain crop growth. Other cash crops commonly grown include cotton, sugarcane, tea, fruit, and rapeseed. Jiangxi also takes advantage of its significant geographic features, including its vast forests, which make up about 59 percent of the provincial territory and contribute to Jiangxi's substantial lumber industry. The province's timber reserve amount to roughly 250 million cubic meters, in addition to 1 billion plants of bamboo, both of which are figures that occupy leading positions in the entire country. Jiangxi is rich in mineral resources, leading all of the provinces of China in deposits of copper, gold, tungsten silver, uranium, thorium, tantalum, niobium, and several others. Some of the notable centers of mining in the province include Dexing for copper and Dayu County for tungsten. Despite its richness in terms of mineral resources, Jiangxi is rather poor among the provinces of China. It is located in extreme proximity to some of the richest provinces of China such as Guangdong, Zhejiang, and Fujian, which are sometimes blamed for taking away the talent and capital from Jiangxi. Jiangxi's nominal GDP for 2006 was about 461.9 billion yuan (60.6 billion USD) and a per capita of 10,679 RMB (1,380 USD). Jiangxi is over 99 percent Han Chinese, however, some of the other ethnic minority groups living in the province include the Hui and Zhuang people. The Hakka, a sub-division of Han Chinese people with their own distinctive identity, inhabit the southern parts of the province, and their cultural influence can be felt strongly across the border with Fujian, where they make up a larger percent of the population. As of 2000, higher education in Jiangxi has been developing rapidly. The province recruited 966 postgraduate students in that year, with 2,118 graduate students. Other higher education institutions had an enrollment of 144,293, while specialized secondary schools had a total of 160,022 and vocational high schools had a total enrollment of 107,203 students. Jiangxi's junior high schools had a total of 2,206,900 students, and its primary schools had a total of 4,226,800 students. The primary school-age enrollment rate in the province is is 99.58 percent. Jiangxi is the main area of concentration of the Gan varieties of Chinese, spoken over most of the northern two-thirds of the province. Examples include the Nanchang dialect, Yichun dialect, and Ji'an dialect. The southern one-third of the province speaks Hakka. There are also Mandarin, Hui, and Wu dialects spoken along the northern border. Ganju is the popular form of Chinese opera performed in Jiangxi. Although little known outside of the province, Jiangxi cuisine is rich and distinctive. Its flavors are some of the strongest in China, with heavy use of chili peppers as well as pickled and fermented products. Jingdezhen is widely regarded as the producer of the best porcelain in China, and has been producing similar crafts for over 1,800 years, since the Eastern Han Dynasty. Jiangxi is a historical center of Chan Buddhism. Prominent examples of Hakka architecture can also be found in Jiangxi. Jiangxi is home to a number of different interesting sites for tourists. One of the most beautiful of them is Poyong Lake, which is not only the biggest fresh water lake in China, but also the largest winter habitat for white cranes. When the winter season arrives, about 2,800 white cranes migrate to Poyang Lake, providing an amazing display for onlooking tourists. Near the northern port city of Jiujiang (九江) is the well-known (and expensive) resort area of Mount Lushan (卢山). Also near the city are Donglin (East Wood) Temple (东林寺) and Tiefo (Iron Buddha) Temple (铁佛寺), two important Buddhist temples. Near the small city of Yingtan (鹰潭) is the resort area Longhushan (龙虎山) which purports to be the birthplace of Taoism (道教) and hence has great symbolic value to Taoists. The region has many interesting temples, cave complexes, mountains and villages. It is considered by many to be the best-kept secret of Jiangxi tourism. 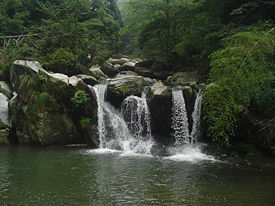 The Lushan National Park has been a UNESCO World Heritage Site since 1996. Interestingly, in 2007, Jiangxi (specifically the Zhelin Reservoir, about 40 km from Nanchang) was the filming location for the fifteenth series of the American TV show Survivor. Jiangxi's good ecological environment, characterized by its rich water resources and wide coverage of vegetation ensure an abundance in wildlife. The province has shown a strong dedication to protecting both the wildlife itself and the environment as a whole, and has seen effective results in that effort over the past few years. Jiangxi has over 600 kinds of vertebrates, including over 170 species of fish, which account for 21.4 percent of the national total of freshwater fish. In addition, there are more than 40 species of amphibious animals, which accounts for 20.4 percent of the national total, and roughly 70 species of reptiles, which accounts for about 23.5 percent of the country's total. Along with those, there are over 270 species of birds in the province, which accounts for about 23.2 percent of China's total. Both fish and birds are large in terms of their number of species, but they also have great economic value to the province. As a result, they have become the priority for protection. One prime example of this has been Poyang Lake, which presents an ideal winter shelter for migratory birds, and has served that purpose well throughout Jiangxi's history. The mountainous terrain and large forest coverage of Jiangxi has made it historically one of the more wild places of central China. South China Tigers have been seen as recently as 15 or 20 years ago, and projects are underway to document evidence of existing tigers, if there are any. Several mountain areas along the northern border with Hunan and Hubei are potential sites for "wilderness" preserves, specifically for protecting or even reintroducing tigers. Other wildlife, though not plentiful, are more numerous in Jiangxi than in many other developed areas of China. Numerous species of birds are common, especially around the marshes of Poyang Lake in the north. Though protected, mammals such as muntjak, wild boar, civet cats, and pangolins, are still common enough that they'll even occasionally be seen in markets for sale as game meat, or possibly even in the forests themselves. This page was last modified on 5 May 2018, at 15:23.